$30 off hosting with GreenGeeks. Hosting is often the most expensive part of building a simple website. Design used to hold the title, but now a self-hosted website only requires a template and a free content management system like WordPress. After that, the only expenses you’ll encounter involve domain names and monthly hosting costs. These hosting charges build up over time, and you have to start paying more money if you need more bandwidth or server space. Every penny counts, and although GreenGeeks has extremely affordable pricing already, you can save $30 when you use our coupon. It’s only available to our readers, and when you think about it, the coupon could give you multiple months of hosting for free. What’s So Great About GreenGeeks Hosting? What Else Can You Expect From GreenGeeks? Don’t Forget Your $30 Coupon Code! Does GreenGeeks offer an uptime guarantee? Does GreenGeeks offer reseller hosting? How do I reach GreenGeeks support? The GreenGeeks hosting plans start at $3.95 per month. This means that a $30 coupon provides almost eight months of hosting for free. We love this offer for startups, bloggers, and other small businesses that need to save money in that first year of operations. Not only are you signing up for a reputable hosting company with free migrations, e-commerce support, and free domain names, but you’re getting a huge discount right from the start. All you have to do is sign up for an annual GreenGeeks hosting package then punch in the DIGITAL30 coupon code upon checking out. This removes $30 from your total cart cost, making your hosting a little bit cheaper for that first year. Just remember that if the coupon code doesn’t work, you probably haven’t selected an annual plan. You already have the coupon code, but in case you forgot, here it is: DIGITAL30. Go to the GreenGeeks website, then click on the View Hosting Plans button. Choose the hosting plan of your choice, then select a domain name or transfer one over. The next page asks you to enter in your personal and credit card information. Under the Package Information header, find the Coupon Code field and paste in DIGITAL30. This automatically removes the $30 you were promised. After that, walk through the rest of the checkout process to start hosting your website for much cheaper than you would have in the first place! Try GreenGeeks. 30-Day Money-Back Guarantee. GreenGeeks claims that it’s the cleanest hosting in the world. We’re not sure how this is measured, but you can at least rest easy knowing that your hosting company is making efforts to preserve energy and use more efficient means when delivering its services. For example, GreenGeeks uses renewable energy sources to power its servers. If you’ve never been to a datacenter before, you can’t imagine the amount of power these facilities consume. We’re talking about giant generators, cooling systems, lighting, and security. Not to mention, all of the servers and backups need power as well. GreenGeeks is an unusual combination of advanced technology and green operations. Datacenters, although all digital, require an incredible amount of power. So, it’s nice knowing that you’re doing your part to help the environment. You’re not going to get a card in the mail saying how much your site has helped the earth, but you can at least check-in on the GreenGeeks blog and learn how it’s improving its systems for a more energy efficient process. Well, GreenGeeks is a one-stop shop for all of your hosting needs. Shared, VPS, dedicated, and reseller hosting all get sold through GreenGeeks. You can also get specialized WordPress hosting or buy a domain name without having to jump around to different companies. This is a huge advantage from a business standpoint since somewhere along the line you might need to upgrade to a more powerful server. A shared hosting account may do fine in the early years of your blog or business website, but eventually, the goal is to convince thousands of people to come to your site. In that situation, a VPS might come in handy. Therefore, you can simply upgrade with GreenGeeks instead of having to migrate your entire site to another host. You might assume that energy efficient hosting would be more expensive than whatever regular hosting you can find elsewhere. Sometimes that’s true, but it’s not really the case with GreenGeeks. The hosting company has done a fantastic job of keeping prices low while still being able to support the environment in numerous ways. Unlimited space to support your site as it grows and as you place more assets on the site. One free domain name and support for an unlimited number of domains to place on one hosting account. Unlimited SSD web space and data transfer. This is how you’ll be able to support spikes in traffic. A free website builder and templates, allowing you to construct a basic website without any need for coding or complicated web design tools. 24/7 tech support is available by phone, email, and live chat. It also has a strong knowledge base and several tutorials to guide you along your way. A free website migration service for those who aren’t satisfied with their current hosting company and would like to shift over to GreenGeeks. A 99.9% service uptime guarantee. Several secure email accounts to improve your professionalism and give your employees the email accounts that associate with your business. 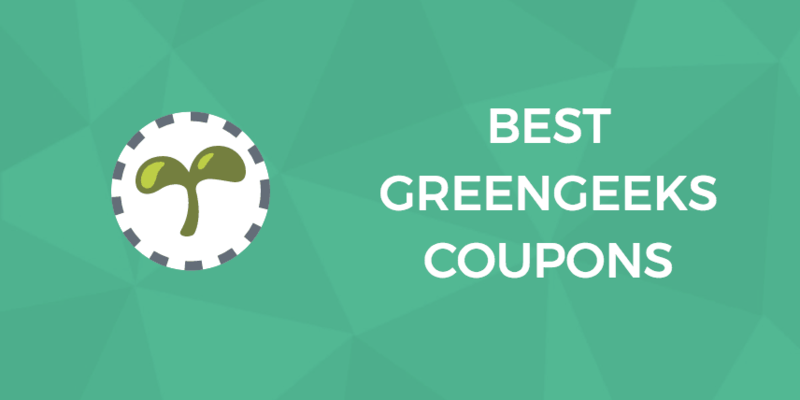 30-day money back guarantees to test out GreenGeeks and see if it’s for you. Now that we’ve covered what shared hosting gets you at a high level, let’s take a look at the individual plans themselves. According to GreenGeeks, the Ecosite Starter option is excellent for “small websites or blogs that are just getting started.” This package includes everything you need to get started. The Ecosite Pro option is great for those with “growing websites that need more speed and resources.” It is very similar to the Ecosite Starter option, but you will get performance that is twice as good. You’ll also get additional support for emails (GreenGeeks will allow you to receive 3x as many emails in an hour). Ecosite Premium is what GreenGeeks bills as its “small business plan” that is ” perfect for very busy websites or online stores.” It is 4x as fast as the Starter plan, and you get built-in PCI compliance. This is in addition to the 24/7 expert support and eco-friendly hosting that come standard with all packages. Furthermore, GreenGeeks passes on its experience with WordPress to you via knowledge base articles and tutorials (for example, the company offers a tutorial on installing, setting up, and using Yoast SEO, a WordPress plugin designed to help you with SEO-related tasks for your website). Unfortunately, we did not see any mentions of free WordPress themes or plugins with the purchase of a specialized hosting package. For those who need hosting for large or resource-intensive websites, GreenGeeks offers VPS hosting options. The plans’ specifications and prices are comparable to those offered by their competitors. GreenGeeks offers an unconditional, no-questions-asked, 30-day money back guarantee, plus a 99.9% uptime guarantee. If you find that what you’ve purchased from GreenGeeks isn’t for you, then you can cancel and receive a full refund of all monies paid, fewer setup fees, domain registration fees, and transfer costs. We were disappointed to see, however, that GreenGeeks makes no mention of what it offers its customers in the event the company is unable to meet its uptime guarantee. If you have a website built using WordPress, and you are looking for top-tier, managed hosting, look no further than WP Engine. You’ll get white glove treatment from this host, and the company will handle many of the tasks associated with web hosting on your behalf. Bluehost is another company that is closely tied to WordPress, but it offers a wide variety of packages that appeal to consumers of all types. There is bound to be a plan that meets your needs and budget preferences. Flywheel, like WP Engine, is a managed WordPress hosting company. The two companies are very similar, but if you are looking for a more entry-level, budget-friendly option, Flywheel might be a better option for you than WP Engine. We can’t say enough about how GreenGeeks can help improve your web hosting while also helping out the world a little bit. If you’re keen on finding companies that think about their social responsibility before selling, consider GreenGeeks as your hosting company. You get a $30 discount when using the DIGITAL30 coupon code, and you’re able to find all of the hosting, web design, and domain tools you need on their website. Which is a pretty great deal, if you ask me. Still have questions about GreenGeeks hosting before deciding if it is right for you? Here are answers to the most commonly asked questions about GreenGeeks hosting. You can also read our full GreenGeeks review here. Yes, they offer 99.9% server uptime guarantee for all their hosting plans. This is pretty in line with industry standards, though there are a few hosts that offer a bit more. They also offer a 30-day money back guarantee if you aren’t happy with their hosting. Yes, GreenGeeks offers a comprehensive reseller package, including domain reseller accounts, ClientExec billing system to manage your customers, and the ability to offer customers a site builder and access to their own cPanel. GreenGeeks offers comprehensive support by email, live chat, or by phone at 1-877-326-7483. To reach their support team by email, you will need to log into your account manager. To reach them by live chat, simply visit their website.